The short name, also called the account name can be changed. Did you create a Mac user account with an incorrect name, perhaps making a typo during setup? Are you tired of that username that sounded cute a few months ago, but is now so yesterday? No matter the reason, it's possible to change the user account's full name, short name, and home directory name used on your Mac. If you're scratching your head at this point because of the popular misconception that account names are set in stone and the only way to change a name is to create a new account and delete the old one, then this tip is for you. Full Name: This is the user's full name. It can be also be used as the login name. Tom Nelson is an example. Account Name (also called the Short Name): This is a shortened version of the full name, such as tnelson. Your Mac suggests an account name based on the full name you enter, but you can use any name you want. The account name is used as the name of the home directory and as the login name. Home Directory: The Home Directory and the Account name are the same. They must remain the same at all times for your user account to work correctly. The Home Directory is usually located in the Users directory of your startup drive, but you can relocate the home directory to just about anywhere you wish. If you made a typo when setting up a user account or you want to change the name, you can do so. Just remember that there are certain limitations, the most important being that the Short Name and Home Directory name must match. If you're ready to change your account information, here's how. This process is going to make some fundamental changes to your user account. As a result, your user data could be at risk. That may sound over the top, but it's possible for a problem to occur during the process of making changes that causes your user data to become unavailable to you. Its permissions could be set in such a way that you no longer have access to it. So, before beginning, take the time to ensure that you have a current backup. If possible, create both a current Time Machine backup and a bootable clone of your startup drive. With the backup out of the way, you can continue. If the account you're going to change is your current administrator account, you will need to first have a different, or spare administrator account to use during the process of changing account information. Log out of the account you wish to make changes to, and log in to your spare administrator account. The option to Log Out is located under the Apple menu. Use the Finder and navigate to the /Users folder located on your Mac's startup drive. Within the /Users folder you'll see your current home directory, with the same name as the account's current short name. Write down the current name of the home directory. In the Finder window click the home directory to select it. Click again in the name of the home directory to select it for editing. Enter the new name for the home directory (remember, the home directory and the short name that you'll be changing in the next few steps must match). Write down the new home directory name. Launch System Preferences by clicking its Dock icon or selecting System Preferences from the Apple menu. Select the Users & Groups preference pane. In the Users and Groups preference pane, click the lock icon in the bottom left corner and supply your administrator password. This may be the password for the spare admin account, not your normal administrator password. In the Users & Groups window, right-click the user account whose short name you want to change. From the pop-up menu, select Advanced Options. Edit the Account Name field to match the new home directory name you created. Once you have made both changes (account name and home directory), click the OK button. The new account name and home directory should now be available to you. Log out of the administrator account you used to make the changes, and log in to your newly changed user account. Check your home directory, and ensure that you have access to all of your data. If you can't log in, or if you can log in but can't access your home directory, chances are the account name and home directory names you entered don't match. Log in again using the spare administrator account and verify that the home directory name and account name are identical. 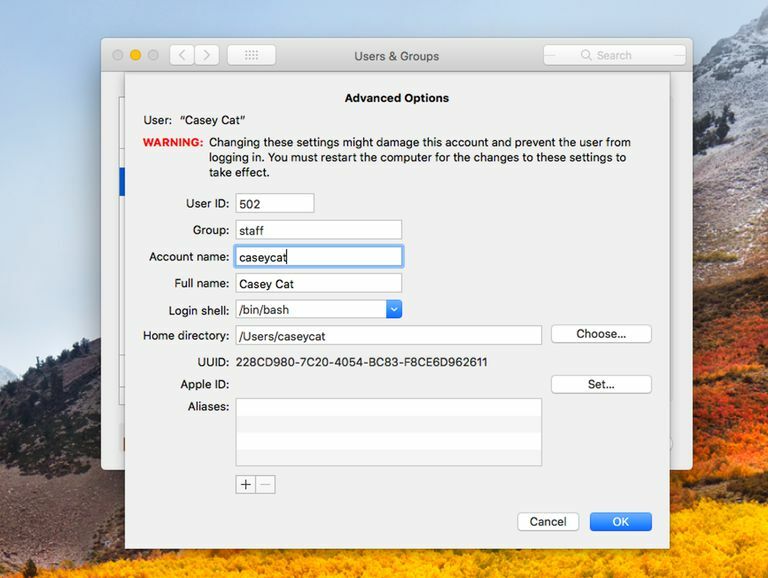 The full name of a user account is even easier to change, although the process is slightly different for OS X Yosemite and later versions of the operating system than for earlier versions of OS X. The user who owns the account or an administrator can edit an account's Full Name. Launch System Preferences by clicking its Dock icon or by selecting System Preferences from the Apple menu. Choose the Users & Groups item. Click the lock icon in the lower left corner and supply the administrator password for the account you're currently using. Right-click the user account whose full name you want to change. From the pop-up menu, select Advanced Options. Edit the name that appears in the Full Name field. Click the OK button to save your changes. Launch System Preferences and select the Users & Groups preference pane. Select the user account you want to change from the list. Edit the Full Name field. OS X and macOS has come a long way from the days when typos in account names were something you had to live with unless you were willing to look up various Terminal commands to try to correct a silly mistake. Account management is now an easier process, one that anyone can handle. What Does a Flashing Question Mark Mean When I Start Up My Mac?